When my longtime French friend, Sandrine, announced her wedding date of July 24, 1999, I knew I wanted to cross stitch something for her as a wedding gift. I couldn't really find anything I liked until I found this pretty design by Lesa Steele. It had romantic feel to it and no words to translate. I modified the bottom of the piece with the simple addition of the couple's first names. I took it to Dan Melvin at Matte Ink for the framing, I chose a lavendar inner matte with a olive green middle matte. Dan wrapped the outside matte with a piece of matching linen. I actually did the first one these for a cousin of mine who was married on May 14, 2001. Unfortunately, I forgot to take a picture of that one. Brian and Heather were married on July 14, 2001, so as you might imagine, these two pieces were stitched back-to-back. 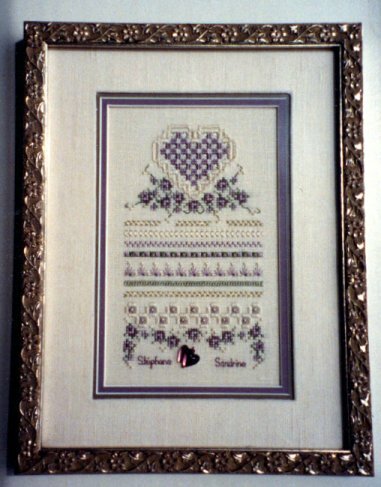 Like Lesa Steele's design above, the original pattern actually called for lavender colors for the flowers. Luckily, both girls wanted blue to match their houses, so I only had to do one conversion. It actually turned out quite nice in the smoky blue colors. I will have to admit though, that it will be another few years before I am ready to do this piece again. Unfortunately, I have another cousing who will be getting married in August 2002. I wonder if I will be able to stitch another one for the happy couple.